Khanpur is a thriving residential locality in South Delhi. It is well connected by public transport and has several options for commutation to all the major parts of the city. Khanpur lies on the Meherauli-Badarpur Road and is close to Madangir, Tigri, Dakshinpur and Dr. Ambedkar Nagar. The Gujjar clan form the predominant population of this area. Khanpur is steeped in history and the Gujjar tribe have been known to play an aggressive role in the fight for Indian Independence in Delhi. But today it is a peaceful neighbourhood that welcomes people from other parts of the city as well as the country. The National Centre training unit of the Indo-Tibetan Border Police's (ITBP) is located here lending safety to the locality in general. Living costs are reasonable and therefore Khanpur has seen a steady influx of people settling in this part of the city. With the rise in its population, several eateries, parks, lodges, healthcare centres and entertainment venues have also mushroomed here to cater to its residents’ urban lifestyle. Pioneer International, Sulabh International and Ramdoot Apartments are lodging option for tourists and travellers in Khanpur. There are lots of temples in the vicinity to cater to the devout community in the area. Khanpur also has quite a few hangouts, eating joints, cafes, fast food joint and restaurants. As far as entertainment is concerned, there are several cinema halls in the vicinity such as NRY Films, Virat Cinema, DT Cinema, PVR Gold Class, and PVR Anupam. The locality is in close proximity to some of medical centres/hospitals for healthcare needs of the residents. Some of them are: ZYCUSLIFE HEALTHCARE PVT LTD, Dr Sunder Lal Memorial Hospital, VIVA - Your Family Chemist and VISHAL Medicos. There are many families, large and nuclear, living here. The basic amenities needed for urban living are all available within close proximity. Since it is a thriving residential colony, it is a good idea to check the peak hours and avoid moving it at that time. Moving to such an urban village requires careful planning and execution so that your home move does not create chaos in the vicinity. This is where an efficient and professional packer and mover company comes in to play. What truly makes our service stand apart is the innovative use of technology which gives wings to our vision. Experience seamless and hassle-free packing and moving solution which is made possible by the worldâ€™s first ever true instant relocation charge auto-quoting engine. Pikkol, conceived as the brainchild of a group of enterprising young men in April 2015, operates as a move manager service platform where customers can search for a tailor-made solution for their relocation needs. 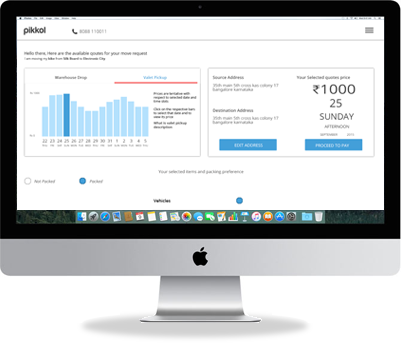 Founded and managed by IIM Alumni, Pikkolâ€™s mission is to make every move happening in India a hassle-free delightful moving experience for our customers. Are you all set to move to Khanpur? Why take the burden of home moving on your shoulders when you have professional help at your disposal. A professional packer and mover can make the entire task of home moving much easier. Don’t tire yourself trying to plan and execute the move all alone. Pikkol Packers and Movers with their wide experience in both local and inter-city moving can ease the trouble. With our motto of making shifting and relocation easy, hassle free and affordable, Pikkol Packers and Movers always ensures a pleasurable experience for our customers. We are a technology aided moving company. We have integrated technology and service which makes the moving process easy and hassle free. We provide timely updates to our customers, provide accurate online quotation, plan the pickup date, and send all the dispatch details online. You can track the movement of your belongings at the click of a button. Our move managers are equipped with GPS enabled devices to provide real time updates at any point of time during the transit. So leave all your packing and moving woes to us and enjoy the excitement of moving in to your new place. #Happy moving!